Hidden and forgotten under mountains of garbage and junk, within a den of Goblins, lies the Mabinogi branch. In order to get to this powerful artifact, you must not only defeat the bloodthirsty Goblins. The Deep Elves will do everything in their power to protect it as well. 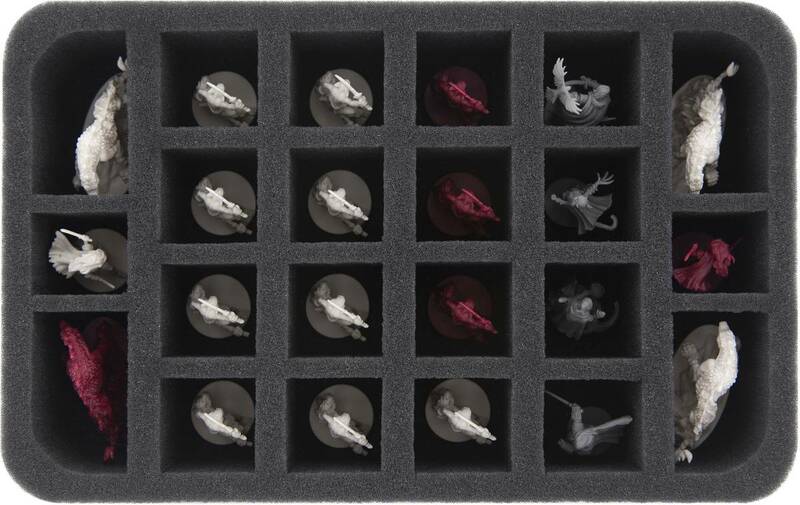 Between the games, your 22 miniatures of the new Hero and Monster Collection "Bonds of the Wild" for Descent: Journeys in the Dark Second Edition are protected with our custom made foam tray. 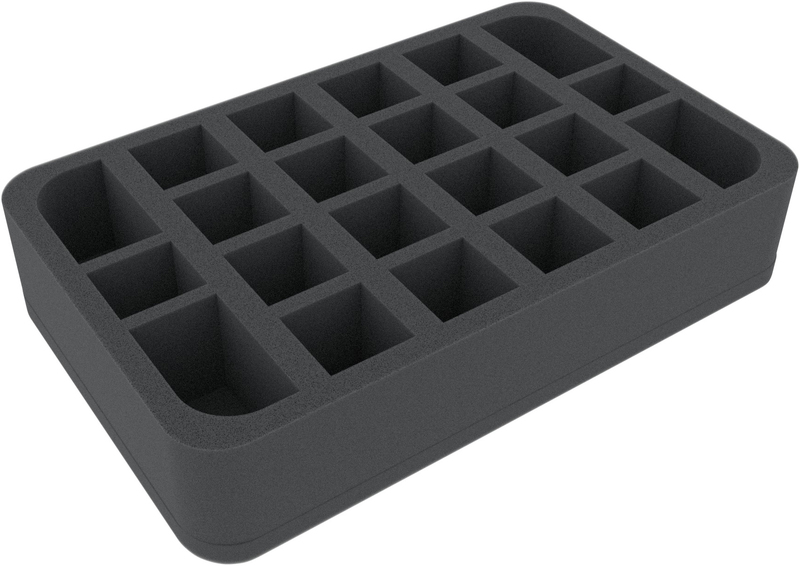 All figures of the expansion can be stored in 22 compartments tailored to them, clearly arranged and softly padded. The four large compartments, with rounded corners, offer space for the Hellhounds. Your heroes Lyssa, Ronan of the Wild, Vyrah the Falconer and Challara can be distributed, along with the goblins and deep elves, into the other compartments. The miniature-precise cutting prevents the miniatures from slipping and colliding during transport. This protects the painted figures from flaking off. Details, such as Vyrah's Falcon, are also spared from storage or transport damage. 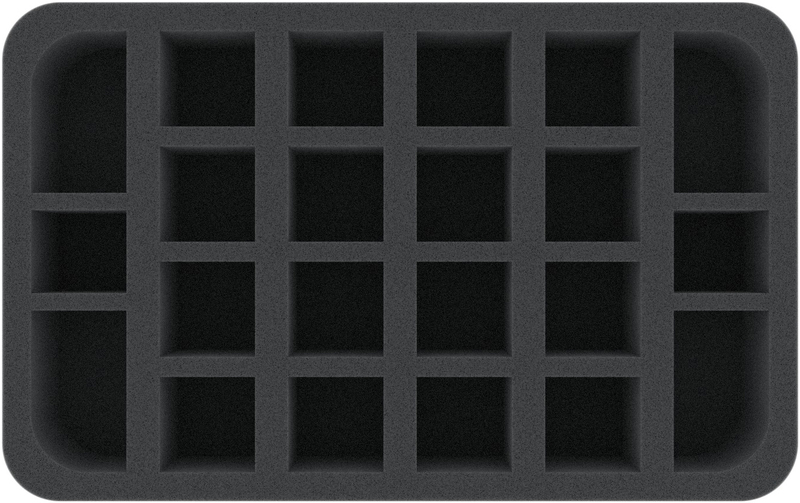 The half-size foam tray measures 275 mm x 172.5 mm x 55 mm. The individual compartments have a usable height of 45 mm. A 10 mm thick foam base adds the mat up to a total height of 55 mm.